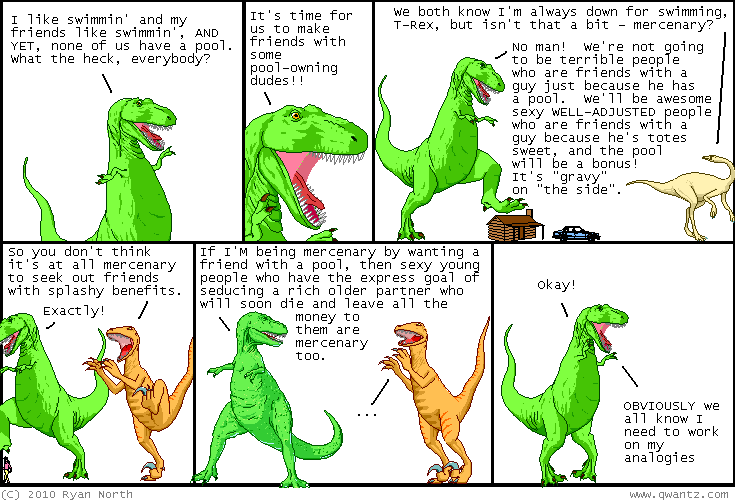 Dinosaur Comics - October 4th, 2010 - awesome fun times! –Or maybe I'd say "Honeybabe, you blew it!" October 4th, 2010: So last Friday I posted this UNPLEASANT NOTE, my reaction to Andrew Hussie moving to the 413. I was speechless all weekend, and for a man who crams so many words (ALL the words) into his comics, that is a thing. All weekend I communicated only with gestures, most of them pointing towards his website. 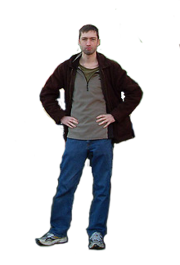 And since I started this public fracas, it is upon me to end it just as publicly. All is forgiven: as a gesture of soul-crushing remorse, this gesture will stand for generations as the shining example, the high-water mark that leaves all other gestures found wanting and insincere. Not only does it finally reveal a secret I'd been wanting to get of my chest for ages (that the background of this here website is really just a photograph of the walls of my office) but it shows a tender moment between colleagues, between men: one crying because the manliest thing it is possible to do is cry alone in front of your computer, the other spying and recording his observations because the next-manliest thing is to do those things in front of a crying man like it isn't even a thing. Andrew, I don't understand why you do the things you do, but - but I can grow to accept them. Knowing you've been watching me for weeks in private moments has strengthened our friendship in ways I didn't know were possible. Let's go on this journey... TOGETHER.